If I make it to the UK this year (hoping perhaps in September) I know what I'm buying. I only hope they have it in the twill as well as the lawn, so that I can make a nice heavy skirt out of it. And maybe a green colorway? Or an orange one? That would be perfect. Don't mind me; I'll just be over here daydreaming about Liberty prints. I know I’ve asked this plaintive, not to say whiney, question before…is it really, honestly true that Liberty is only available on e-bay or in the UK? Sigh. You’re a fabric enabler! (I found it in blue in that ebay shop and clicked “buy it now”). :)But really, no complaints! I never ever ever find prints I like, let alone in some lovely Liberty!I have seen a few bolts of Liberty at an upscale fabric stores in Oregon and Texas, but they never looked that awesome. Congrats on the feature in NYT’s “The Lede” blog! 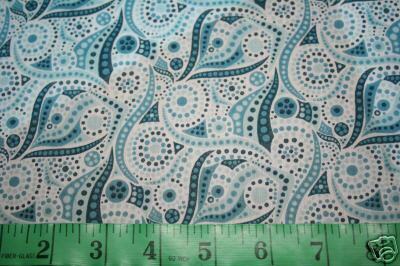 I’ve seen Liberty lawn at G Street Fabrics here in DC, but always well out of my price range, alas. Right now I am obsessed with the Liberty feather print. So lovely. I’m loving that blue squiggled fabric! I want to find out where I can get stuff like that. *sigh* Liberty.Lawn. I have a beautiful piece I bought in the summer of ’88, in downtown Chicago. I STILL have not made anything because I am still waiting for the perfect blouse pattern to magically appear. I just go up to the attic and feel the fabric(wrapped in the Liberty tissue paper still) every now and then.